If you have a picky eater in your group, we have something in common. My youngest son could live on chicken fingers and Cheerios, so that’s another reason why we love the ‘Tween Waters Inn. For starters, breakfast is free for resort guests (score!) — just head to Captiva House for an all-you-can-eat buffet. Feast on homemade pastries (made onsite), bowls of whole and sliced fruit, assorted cold cereals, breads and bagels, yogurts, hot cereals and cheeses. A separate menu is available with omelets, huevos rancheros, pancakes and French toast, for a nominal fee. I happen to be a big fan of the oatmeal. For lunch, no shirt, no shoes, no problem! The Oasis Pool Bar and Grill is open 11:30 am to 5 pm and the smoke from the grills will make your mouth water. Order at the counter or grab an open table. The menu offers sandwiches, wraps, gyros, hot dogs, burgers, and salads. The Char Broiled Grouper sandwich scores high marks with my teenager. Dinner is a toss up between Captiva House and Crow’s Nest. Both offer a kid’s menu, but Mondays and Thursdays, we choose the Crow so we can participate in their famous Crab Races. “It’s the stupidest thing you’ll ever see,” but the 6pm show is family friendly and has raised over $225,000 for the United Way. They serve a buffet on these nights; every other night they offer a large menu. Our fav is the chicken barbecue pizza and ice cream sundaes but their ‘Gulf Shrimp and Grits’ is SO good, with shrimp, chorizo sausage and cheese grits. Yum! 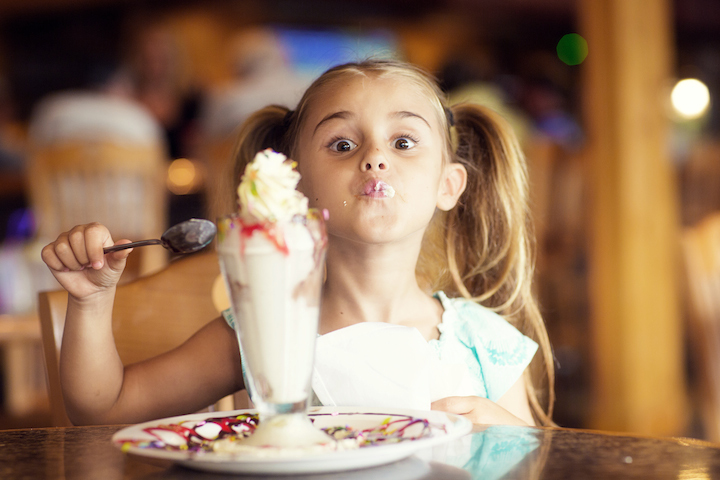 Your kids will love the sundaes at Crow’s Nest. Captiva House is the top rated restaurant on Captiva by TripAdvisor but don’t let that scare you from dining here with kids. By day’s end, my little one can be crabby, but we LOVE the food here, so we make reservations early, before the meltdown. Many times, there several other families dining right alongside us. Blue crab bisque, bouillabaisse, twin lobster tails…oh my. Instead of dessert, we have Devon (my youngest) throw a few dollars in the piano player’s tip jar. It’s a nice way to end the evening. I hope you’ll try these onsite restaurants on your next visit. Let me know what your favorite dish was!